The name of the net. A net name can be up to 30 characters long. For a frequency hopping net, these entries correspond to the lower and upper limits of the hopping set. The program computes the mean frequency as the entry for the propagation model. The terrain surface refractivity is a measure of the air refractivity above/near the ground. In general, the average refractivity would decrease with altitude, being a maximum at sea level. Area specific data is in the table below. In the absence of any specific data, the default value should be used. These properties determine together the nature of the radio wave reflection on the ground in a Line-Of-Sight radio link. In general, the more conductive the terrain is, the greater is the risk to have important attenuation or fluctuations of the radio signal. The worst case is the “picket fence” type. In the absence of any specific data, default values should be used. Either horizontal or vertical (in accordance with the system in use). 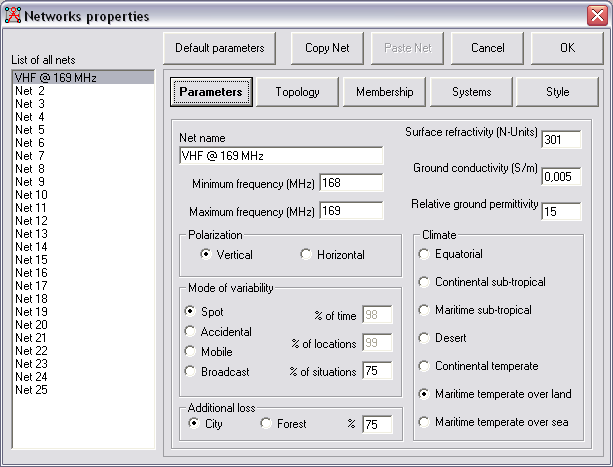 The Mode of Variability settings modify the statistical margin value shown in Radio Link that is added to the link's path loss. The Spot mode is for a one-try message. The Accidental mode is for interference evaluation. The Mobile mode is for units that are moving while communicating. The Broadcast mode is for stationary units. The effect of percentage of time, locations, and situations depends on the mode selected. This option is used to select the type of climate mostly encountered in the selected deployment area. These options set some of the calculation parameters in the ITS algorithm used in the program. The atmospheric conditions like climate and weather vary in the different areas of the world, and affect both the refractive index of free air and play an important role in determining the strength and fading properties of radio signals. For instance, the refractive index gradient of air near the surface of the earth determines the way a radio ray is bent or refracted as it passes through the atmosphere. here additional compensation can be set for Forest or Urban environment. In the case that Land Cover is enabled this option will not be displayed. Also the values will be determined from the settings in Land Cover.